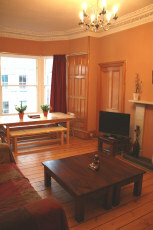 We are a small family run business, with currently two city centre self-catering properties available in Edinburgh. The two flats have been our homes for some years and are not just rental properties, so we hope that you enjoy staying in them and appreciate them as much as we have. We hope that we can make your stay enjoyable and hassle free, a real home from home experience. We also run the tourist information centre in the Isle of Skye, which has many ideas for trips and places to visit. The flat in McDonald road is located very close to the famous Edinburgh Playhouse theatre and City Centre. The flat at Lauriston Gardens borders The Meadows, making it a nice, peaceful location, but still right in City Centre. 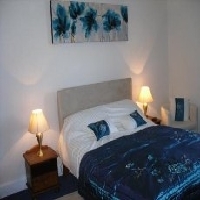 It is within easy walking distance of all the major attractions, and is a 10-15 minute walk from Edinburgh Castle. Flat 5, 20 Lauriston Gardens is a big, bright, top floor flat in a traditional Edinburgh Tenement. It has three double bedrooms, two single bedrooms, a large, bay-windowed lounge, with high ceilings and decorative cornice, a fully-fitted kitchen, bathroom, separate shower room, and large alcoved entrance hall. With a double sofa bed in the living room, it can accommodate up to 10 guests. It is centrally heated, with wi-fi and Cable TV. A DVD player is also available. The flat has a wide selection of excellent shops, restaurants and theatres within a 5 minute walk, and borders the park that forms The Meadows. Tennis, cricket, and an excellent children's park are all available here, whilst putting is also available at Brusntsfied Park just across the road.